Monday means another block of the Summer Sampler 2016 quilt along! 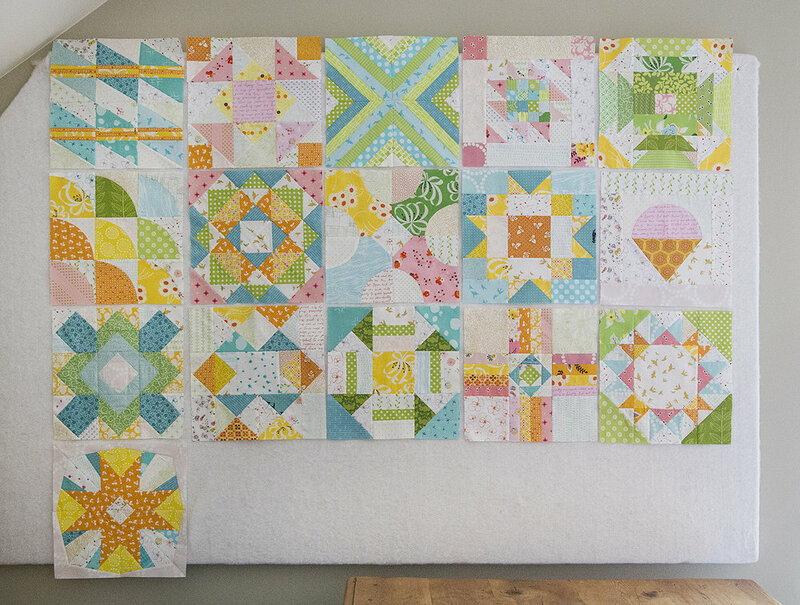 This week's block, Starshine, is designed by Holly DeGroot of Bijou Lovely. It is foundation paper pieced, which is one of my personal favorite techniques. I love how it allows for everything to be so exact, and all these fun shapes and angles. My one tip this week - as always when paper piecing - is to make one unit first and make sure the cut fabric sizes work best for you. The sizes listed in the pattern are the sizes we used to make our blocks, but if you are new to paper piecing, you may want to work with bigger fabric pieces. And that's ok! We are on the final row of my design wall. I can't believe soon we will be talking about quilt top layouts!